For some poets the act of writing poetry is almost all to do with producing polished and finished works, and such poets often write relatively few poems. For example, almost every one of Kenneth Slessor’s one hundred or so poems are conspicuously ‘made’ things, crafted and polished as individual works that stand alone in their own poetic space, reflecting a particular, disciplined poetic sensibility. Other poets may produce such polished works but are as much, or more, concerned with poetry as an ongoing inquiry into and investigation of the resources of language and the ways language constructs and construes meaning. John Kinsella is one such poet – prolific, restless, frequently returning to preoccupations about the environment and the consequences of its degradation and, in doing so, writing a discontinuous poetic chronicle of his experiences in Western Australia’s Avon Valley. He is also often focused outwards on international concerns and issues, and on personal and public ethics, and is a traveller who writes about places he visits. In these ways he is powerfully engaged in his poetry with both the quotidian and the abstract. Yet Kinsella also has another major preoccupation, and that is a continuing investigation of the language of the contemporary lyric, particularly as it manifests in various versions of the contemporary pastoral. This is a tradition that he has to some extent re-fashioned in his own, sometimes idiosyncratic image, frequently writing what Marthe Reed, following Rob Wilson, terms ‘anti-pastoral’ poetry. In applying this term to Kinsella’s poetry, she states that his ‘dark vision of place recognizes in agriculture, as it has been practiced in Western Australia, nothing of the European idyll of Arcadian happiness’ (Reed 2010: 92). One interpretation of his complete oeuvre is as a questing exploration and a testing of what contemporary poetry might say in extremis – particularly in the face of environmental crisis – and how language might be adapted, and even pulled and stressed, in order to say it. 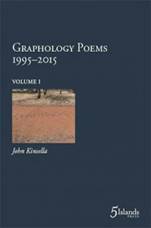 The three-volume publication, Graphology Poems: 1995-2015 foregrounds this enterprise more clearly than any other volume Kinsella has published. and inside I’m stuck for words. In other words, among other things, this book is a way of Kinsella putting his poetic craft under a scrutinising gaze, and asking ‘what do I see here?’ In the hands of a less wide-ranging writer such an enterprise might be largely solipsistic, yet Kinsella’s work justifies this extended excursion into linguistic self-analysis because he finds in his examination of his own task as a poet issues of broad interest, turning this enterprise and its attendant preoccupations outwards. What are these issues? Impossible to fully summarise across the vast tracts of these three volumes, they are mostly about Kinsella’s repetitive probing of what one might name as an environment-self-language nexus. And they are about politics and social injustice as poetry might understand it – that is, as a restless articulation of contemporary political and social absurdities, strangenesses and injustices perceived through the lens of a writer who refuses to identify with the mainstream and yet has, with a keen sense of irony, contradiction and multiplicity invoked for his own purposes many of its tropes and issues. Such poetry can, at times, be uncompromisingly blunt, and that is the purpose of some of it – to speak directly about what Kinsella believes urgently needs to be said. Kinsella’s concerns are also about marshalling a sense of the world’s never-containable, protean indeterminacies, channelling them into what one might call the real-unreal of poetic utterance; an utterance that, in Kinsella’s hands is always trying to address large and small things at once, but which knows there is no settling down, never the opportunity for conclusion, and not much that is even temporarily fixed and stable. Nevertheless, the restless inquiry of these volumes states that some things have a continuing importance – that language offers the possibility of a sustained and salutary self-inquisition; and that abstractions garner much of their life from the development of a restless personal ethics centred on inquiry into and speaking about contemporary values and mores. In this last sense, Kinsella has defined himself as a public poet. In an interview with Harold Bloom about Australian poetry for In So Many Words (2013), Bloom stated that it was very good ‘[f]or Australia to have had Judith Wright, Alec Hope, Les Murray (who can be a very difficult personality – we have had our moments, but still he is a very powerful poet) and John Kinsella’ (11). Indeed, Bloom wrote the introduction to Kinsella’s Peripheral Light: Selected and New Poems (2004), which includes references to similarities between Ashbery’s work and Kinsella’s. Certainly Kinsella shares Ashbery’s interest in longer forms and Graphology is a project that ramifies to such an extent that it even extends beyond the confines of these three volumes – indeed, Kinsella has described it as ‘the long poem that one writes over a lifetime’ (Kinsella nd). 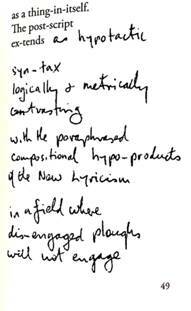 While it began in the late 1980s, the first publication of Graphology dates back to 1997 when an eponymous booklet was published by Equipage (Cambridge); the second part to The Radnoti Poems (1996). Since then, poems from this project have been published in a wide range of print and online journals and books. Many are collected in this three-volume set. 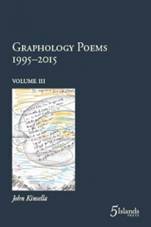 However, in a note reminiscent of ‘The Hunting of the Snark’ that precedes the contents page, Kinsella states: ‘Some [Graphology poems] are in other books presently in print (often without their Graphology attributions and titles), while others remain (hand-written) in journals and notebooks. Others are difficult to locate.’ Furthermore, there are three poem essays, or poem notes, that self-reflexively discuss the Graphology project and precede the poems in the first volume. In ‘A Short Note on Graphology’, Kinsella makes the point that ‘the pieces were often composed in a sequential and chronological format, numbered accordingly, though at times the numbering has leapt and reversed and become – seemingly – inconsistent’ (1: 13). In this way, resistance to closure is important to a reading of this behemoth of a poem (or sprawl of poem-parts). Scholar Nic Birns in his essay on Graphology has described it as ‘a vast dilating rhizome’ (Birns 2016). Indeed, while the poems in Graphology are numbered, they challenge any notion of genesis and chronology. The project’s inbetweenness emphasises a kind of nomadism, where the reader becomes a wanderer in something non-linear and non-hierarchical. This gestures to Graphology’s exploration of the unreliability of memory and its inconsistency. In this way, the poems in Graphology point to the inauthentic, which exists as part of the veritable. Indeed, Kinsella suggests this infallibility can lead to false memories and, by extension, false identities. This, in turn, posits questions about Kinsella’s obiter dicta and public persona concerning Graphology. He has discussed the project in interviews, blogs and books. Could he be providing the reader with the key and yet simultaneously gesturing away them away from it, in a Carrollian effort to encourage the reader to find their own meaning? Indeed, it is the subversive quality of the long poem, its illusive shifting sand, that helps make reading it a biotic interaction. Your subject is our field to tackle. and fertilisations. Gross and fine. and in reverse. Verso unto recto. Kinsella might almost be talking about his own work rather than Wiebke’s, and offering a challenge to his readers to ‘tackle’ his poetry as their own ‘field’ and ‘landscape’. Such an invitation represents a dual impulse of invitation and resistance and it lies at the heart of these three volumes of poems and their interconnectedness – and it gives this long poem, at least, a notional cohesiveness. 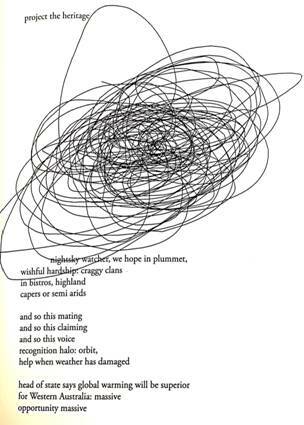 While Graphology includes runs of sequences (short and long sequences titled, for example, ‘Holograph’, ‘Un-numbered’, ‘Faith’, ‘Icon’, ‘Heuristics’ and even ‘Cambridge Psychedelia’), there are no clear beginnings and endings; indeed many poems are untitled and form their own silent sequence(s). Kinsella is exploring ways in which the oppositional is concatenated. In this way, pessimism about the environment manifests itself in hope for the future. 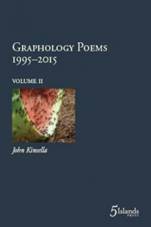 While many reviewers choose the more overtly political poems to explicate, two poems that are quietly optimistic and demonstrate Kinsella’s private nature in the construction of a public identity, are ‘Graphology 4247: A True Dream Recounted’ and the final poem in volume three, ‘Graphology Mutations 27’. and language are filched from. Importantly, the narrator in this poem manages to be above earthly problems and drama yet entirely invested in them; just as one might argue that the reader of Shakespeare’s quartos or folios is perhaps bookish and yet common in the way ‘plight plots / and language are filched from’ his plays. This is underscored by Kinsella’s referencing of The Tempest in this poem and also Macbeth in the ‘eternal tomorrows’ and perhaps even Banquo in the repetition of ‘fly’. staying unreachable in a damaged world. Where ‘Graphology 4247…’ ends on the promise of ‘eternal tomorrows’ with the narrator floating dream-like in his / her Dreamliner, the narrator of ‘Graphology Mutations 27’ describes the ‘future’ as one of ‘entice and hurt’. The huge mouth of ‘machinery eat[ing] away at the valley’ is a dark parody of Tim singing a ‘high G’ as the rhyming couplet and midline rhyme of ‘tree’, ‘valley’ and ‘machinery’ ends in its own music. Indeed, the use of Heidenröslein as an intertext also references what Kinsella has described in his poetic essay, ‘Points of Modulation’, as the music that holds these poems together: ‘The shifts between poems are equivalent to pivot chord modulations in music’ (1: 14). This underscores Kinsella’s belief that ‘Letters of protest are also ways of saying thanks. To protest against the destruction of bushland is to affirm the necessity or sanctity of that bushland…’ (1: 14). It is the eternal tension between the ‘rosebud and thorn’. Kinsella’s reputation extends beyond poetry to his blog with Tracy Ryan, ‘Mutually Said: Poets Vegan Anarchist Pacifist’. He is also present on YouTube, such as when he reads his ‘Bulldozer’ poem . In Poetry and Activism Undammed Gary Snyder argues, ‘poetry is a form of activism. If you write things down that go out into the community, they will affect change’ (Snyder 2012: np). Writer and scholar Louis (Luke) Menand, who has been labelled a public intellectual but eschews the title, argues that it is more than this. He believes a poet who is identifiable as a public intellectual needs to write with activism in mind; it is not enough for poems to be interpreted as activist by a reader. And perhaps the most famous public intellectual, Noam Chomsky, argues that the cliché of the public intellectual ‘speaking truth to power’ is a pious phrase that conceals truth. He believes that it is people who are oppressed by those in power – not those in positions of power – who need the truth. He divides public intellectuals into two distinct categories: conformist public intellectuals and dissident ones. For Chomsky, the dissident public intellectuals are important precisely for their dissension (Atherton 2014: 128). Poetic activism of this kind is in a variety of ways porous. It steps out into the quotidian world to encounter the occasions it addresses and to register its protests, and it simultaneously steps back into the poetic, which is always partly about the action of language. As it does so it brings a highly constructed language into the realm of public debate, and takes back into the poetic the grit and noise of the activist’s engagements. As a result, poetic structures made in the crucible of activism are often neither entirely ‘poetic’ in the conventional sense, nor entirely ‘activist’ in the sense of campaigning for direct and immediate change (although some of Kinsella’s poetry does do this). Rather, many of these poems exist as both public statements and private accounts of what Kinsella calls ‘witness’, but which might equally be understood in this context as an urge to see and make known. Cloth ear hangs on clothesline. Hung out to dry. Smokey, hazy day. A mirror of itself. Hear it. There is something simultaneously plain-speaking, lyrical and rather surreal about this short work, and such mixed tropes characterise much of what Kinsella attempts. In Graphology we are able to read him (reading himself) as lyrical, anti-lyrical, polemical, questioning, observant, quizzical, philosophical, critical and ironic, all at once. This may be what is most significant about the Graphology project in the end – its ramifying openness and the interconnecting complexities of its sometimes riddling texts. Often the spaces of these poems open out to reveal absences or to imply other texts that are (as far as we know) yet to be articulated. In this volume it is the sum of the incomplete parts that implies a greater whole. It may partly have been Kinsella’s reputation as a poet public intellectual that made the publication of this limited edition three-volume set of poetry possible: he is one of perhaps two or three Australian poets with an established international reputation. With more than 740 Graphology poems collected from at least 4700 poems in a three-volume ‘limited’ edition, it has not been produced for a broad readership. However, Graphology asks a small group of dedicated readers and writers of poetry to think intelligently and politically about the world and about language and to lobby, even in small ways, to enact change. Cassandra Atherton is an award-winning writer, academic and scholar. She was a Harvard Visiting Scholar, sponsored by Stephen Greenblatt, in 2016 and was a Visiting Fellow at Sophia University, Tokyo in 2014. She has published eight books (with two more in progress) and is the successful recipient of more than fifteen national and international grants and teaching awards, including an Australia Council Grant and a VicArts grant. Her most recent books of prose poetry are Trace (Finlay Lloyd) and Exhumed (Grand Parade). Paul Hetherington is Professor of Writing at the University of Canberra and head of the International Poetry Studies Institute (IPSI). He has published eleven full-length collections of poetry, including the recently released Burnt Umber (UWA Publishing 2016) and Gallery of Antique Art (Recent Work Press 2016) and five chapbooks. He won the 2014 Western Australian Premier’s Book Awards (poetry), was shortlisted for the 2013 Montreal International Poetry Prize and commended in the 2016 Newcastle Poetry Prize. He was also recently shortlisted for the international 2016 Periplum Book Competition (UK).